Posted on Wed, Apr 20, 2011 : 5:58 a.m. In the wake of Borders' bankruptcy filing, many bibliophiles have been discussing the doom of the physical bookstore. And it’s not just the larger chain store. Independent Stores have also had a tough ride. Nationwide, booksellers are facing competition from big online sellers like Amazon.com, e-books and big box stores. Earlier this month, AnnArbor.com reported the closing of Crossroads Christian Bookstore, the owner announcing that he would move sales to online. Shaman Drum is still missed, though its closing was well over a year ago. Now, another Ann Arbor local independent shop will be gone by the end of May. David’s Books, at 516 E. William St., has been in Ann Arbor since 1979. The store will be closing its doors as the store lease comes to an end. Ann Arbor's David's Books to close in May. Owner Ed Koster has already begun selling off the store’s used books at half price. He said the store has a wide range of books in all interest areas with plenty of literature and rare finds. When the store closes, Koster is not sure what he will do next. “It’s just too much trouble to move and find a new location,” he says. He hopes to keep some books, and continue to remain active online for some time, selling used and rare books via the store's website. David's Books' recent years have been marked by troubles. In August 2008, Koster was accused of orchestrating a scheme in which he hired "drug addicts to steal textbooks from competitors and later selling the books on the Internet," the Ann Arbor News reported at the time. 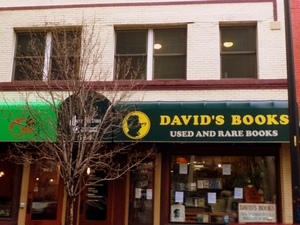 David’s Books has been at its current location since 2003, when it moved from its space on State Street above Potbelly’s Sandwiches. Rumors are circulating that Asian Legends could expand into the neighboring space, but the restaurant's owners were not available for comment..
Angie Smith is a freelance contributor to AnnArbor.com. You can reach her via email at angieannarbor@gmail.com. Thu, Apr 21, 2011 : 3:05 a.m.
Have to admit that I rarely shopped at David's Books. The atmosphere is much more welcoming (and the collection somewhat easier and more fun to browse) at Dawn Treader, right down the block -- or more recently, down the block and around the corner. Still, it is another sad sign of the decline of Ann Arbor as a reader's paradise. But the store will be memorialized for some time to come by the iconic David's Books mural that still appears above its old location on Liberty Street. I'm sure lots of people would name that mural as one of the symbols of Ann Arbor. It was commissioned by David's back in 1984, and I think it was restored fairly recently. Wed, Apr 20, 2011 : 9:36 p.m.
A little information about the publishing biz: The publishers set the prices for books, and it is usually printed on the book or its dust jacket. Bookstores and wholesalers (like Amazon) buy books at a set discount. The discount for wholesalers is a bit more for a variety of reasons, and the difference is usually a few percentage points. Since bookstores get a smaller discount, they are limited as to how much they are able to discount a book. Businesses like Amazon have the ability to discount more because they get a larger discount, AND because they use books as loss leaders. Amazon can afford to lose $5 on a bestseller like The Girl With the Dragon Tattoo because they make it up on the sale of big screen TVs or other large ticket items that account for most of their business. Bookstores don't have the ability to do that. They can't lose money on the books they sell because that is ALL they sell. Keep in mind that for every dollar you spend at Chain stores, only 43 cents stays in the local area. For every dollar spent in local stores, 68 cents stays in the local area, and for every online purchase 0 stays in the community. Buying local is the best way to keep Ann Arbor/Ypsilanti going. Wed, Apr 20, 2011 : 8:26 p.m. Many of these used bookstores work in concert with, for example, Amazon who provides a way for them to sell used books online. The question of David's may be more individual. I love browsing the used book stores and also buy from them on-line. But David's had a small selection, unwelcoming atmosphere, and (after the &quot;scandal&quot;) unpleasant question of the origin of the stock. I will still visit and frequent the other stores. I never come downtown without at least browsing in one. Wed, Apr 20, 2011 : 5:48 p.m.
David's Books has been in Ann Arbor for more than 32 years. It was already here in the mid-1970s, in a location on the north side of Liberty. Wed, Apr 20, 2011 : 6:39 p.m. Didn't he rent a corner of Schoolkids Records around '74-5? Wed, Apr 20, 2011 : 4:06 p.m.
Thu, Apr 21, 2011 : 12:13 a.m. The Reuse Store on South Industrial has a huge selection of used books. Wed, Apr 20, 2011 : 8:27 p.m. Dawn Treader is my personal favorite. Wed, Apr 20, 2011 : 8:12 p.m. Wed, Apr 20, 2011 : 7:18 p.m. Wed, Apr 20, 2011 : 5:05 p.m.
West Side Books, in the 100 block of west Liberty, just off Main st. Wed, Apr 20, 2011 : 4:47 p.m. Wed, Apr 20, 2011 : 4:30 p.m. Wed, Apr 20, 2011 : 3:59 p.m. Yes, it's one place that definitely won't be missed. The original David was a nasty person, and the current ownership was disgraceful as others have noted. Wed, Apr 20, 2011 : 3:53 p.m. I don't see how any kind of &quot;mom and pop &quot; businesses can survive if they are in direct competition with large retailers. Wed, Apr 20, 2011 : 2:23 p.m.
what will drug addicts do for money? Thu, Apr 21, 2011 : 12:11 a.m.
Get jobs at McDs their hiring over 50'000 people nation wide. Wed, Apr 20, 2011 : 1:31 p.m.
Oh well. Criminal scandals aside, I've never found him to be particularly customer friendly. I've always felt like I'm bothering him by buying something. His stock is nothing like it used to be 20 years ago when he was upstairs but that is probably symptomatic of the changing book market. Maybe used bookstores are a thing of the past. Too bad. Wed, Apr 20, 2011 : 7:17 p.m. Agreed! I never found the service to be particularly good there and good service is a MUST when I can count several other places to buy books within a few blocks (including my favorite - the guy outside Ben &amp; Jerry's with books for $5! Wed, Apr 20, 2011 : 5:04 p.m. I think many people are selling their books online, and academia is increasingly moving to the electric journal article or electronic textbook over printed books. So, supply is more limited. Also, Borders carries a far less diverse selection of titles than it used to as well, and buyers of new books eventually are the sellers of used books, so if there are fewer good books entering the &quot;food&quot; chain, then that trickles down. Wed, Apr 20, 2011 : 1:20 p.m.
&quot;Shaman Drum is still missed...&quot; By who? Wed, Apr 20, 2011 : 4:58 p.m. I hope that this is meant to be sarcastic... Yes, there actually are people in this town who very much miss Shaman Drum. It was a place run by people who loved books. I am not the only person who has a hard time passing by the noisy, highly overrated and, to me at least, unhealthy chain eatery that has taken its place. The old store was a community resource and contributor that will be remembered, even if by a small group of us. Wed, Apr 20, 2011 : 4:20 p.m.
By me too and many people I know. It was where I most often bought books. Great selection, cool clerks, and a beautiful store. Wed, Apr 20, 2011 : 4 p.m.
By me and lots of people I know, at the very least. Wed, Apr 20, 2011 : 12:56 p.m. Wed, Apr 20, 2011 : 1:03 p.m.
Just made that correction - thanks for catching. Wed, Apr 20, 2011 : 1 p.m.
People ALWAYS do that. It's WilliaM folks, there is no &quot;s&quot; at the end. Just remember Will I Am and you'll do fine. Wed, Apr 20, 2011 : 12:54 p.m. It seems a bit strange that the article didn't mention the scandal that's still fresh in the minds of commenters here. I'm surprised the store has lasted as long as it has. Wed, Apr 20, 2011 : 12:42 p.m.
Progress. Time to move on. I can pick up anything that David's Books has available online at half the price. Wed, Apr 20, 2011 : 12:40 p.m. Wed, Apr 20, 2011 : 12:55 p.m.
Because he had to ditch the business model of selling stolen merchandise on the internet? Wed, Apr 20, 2011 : 12:35 p.m. Wed, Apr 20, 2011 : 12:36 p.m. I mean seriously, recruiting the homeless to steal expensive textbooks and reselling them? How Ann Arbor is that? Madison, Berkeley, et. al. have to be jealous. Wed, Apr 20, 2011 : 12:20 p.m. Brick and mortar stores are a fun and relaxed atmosphere. However the price of books are so much higher than online it's no wonder these stores are closing. It's great when people support local businesses but a $20 savings in this economy is a huge savings. Maybe if the B&amp;M stores would bring the prices closer to the online prices maybe they might stay in business. As an owner of one of those brick and mortar (used) shops, most of my better books are very much in-line with prices on the internet, and always have been. And, with Amazon prices, it is actually cheaper to buy some books in shops rather than online, because you don't pay shipping. Three .01 cent books actually cost $12, not three cents. And I often see books in shops priced well below online prices. In fact, a regular part of my business is buying those books in other shops, and selling them to people online at a nice profit. So, narrowing your field may actually cost you money, rather than saving it. As for shops selling new books, Amazon does have some steep discounts on new books. However, I do prefer to browse and discover in a shop, s other is value for me there. And unless you are buying a very expensive new books, saving $20 on recently published titles is the exception, rather then the rule. Wed, Apr 20, 2011 : 11:07 a.m.
Wow. We can really use another restaurant downtown. Who needs the social and cultural variety offered by having shops like David's Books pepper the downtown area? I don't see it benefitting the DDA or city tax coffers. If we're lucky, maybe McDonalds and BK can find space downtown too. Then the cultural transition will be complete... Just the other day I drove by and remarked how I needed to stop back in at Davids books soon as it is such a great place. I guess it wasn't soon enough. Sad to see it go. Hope to get in there before it closes. Wed, Apr 20, 2011 : 11:49 p.m.
Well it looks like the big chains were all moved out in the past twenty years. There used to be a McDonalds and a Burger King less than a block away... So continuing the sarcasm a bit more, how about yet another designer burger joint? Or maybe yet another sushi joint? Wed, Apr 20, 2011 : 11:04 a.m.
&quot;An Ann Arbor bookstore owner charged with buying and reselling stolen textbooks pleaded no contest Tuesday to two felony charges just before his trial was set to begin. Edward Stephen Koster, who owns David's Books near the University of Michigan campus, was accused of hiring drug addicts to steal textbooks from competitors and later selling the books on the Internet.&quot; <a href="http://blog.mlive.com/annarbornews/2008/08/owner_of_davids_books_pleads_n.html" rel='nofollow'>http://blog.mlive.com/annarbornews/2008/08/owner_of_davids_books_pleads_n.html</a> I weep not in this specific instance. Wed, Apr 20, 2011 : 4:51 p.m. I have to say tho, since when does one need to hire or organize drug addicts to steal? Or perhaps they, middle class drug addicts not homeless ones, stole on their own to feed their habit from the shops, sold the books to one who may have not unfortunately have done due diligence, then, to avoid stiffer sentences, blamed the buyer, who didn't have enough money to fully defend himself in court? I don't know what happened, but nolo contendre is not a guilty verdict. And it was accepted, which might mean the case, and the witnesses, were not as strong as one might hope. I've just never believed the &quot;organized ring&quot; angle on this.